Learn to make perfume and create your very own signature scent, with this fun and fragrant perfume making experience! Learn to make your own perfume, and create your very own signature scent, with a fun - and very fragrant - perfume making course! 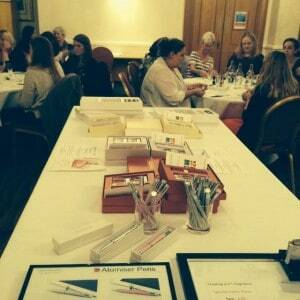 Available at locations throughout the UK, this perfume making class is a wonderful hen party idea or birthday party idea, and makes a great experience gift for women who like to stand out from the crowd! You'll be welcomed by your fragrance consultant, who will begin the session by talking you through the process of perfume-making. Next you'll be introduced to the 21 different notes that you can choose from to create your special scent. These include top notes, middle notes and base notes, and will include floral, citrus, musky, mossy, fruity, spicy and sweet scents. Your challenge is to follow your nose, and decide on a blend of these that you think will work! Once you have chosen the blends you want in your perfume, your fragrance expert will create it right in front of you. Now all you have to do is name your creation! You'll receive a 5ml glass bottle to take with you in an organza bag at the end of the experience, and will register your perfume within the fragrance library. If you're looking for a fun birthday party or hen party idea, or a special birthday gift for someone creative and original, why not try one of these fabulous perfume making experiences?! Various dates each month in each location. The perfume making London experience is suitable for almost anyone. Under 16's are welcome to participate, but each person under 16 must be accompanied by a voucher-holding adult. This experience will last approximately 1 hour but expect to be at the venue for up to 90 minutes. Participants: The Create Your Own Perfume - Gold Experience is for 1 participant. The group size is generally between six and thirty-two people. Wear whatever you feel comfortable in. The Create Your Own Perfume Experience is not a weather dependent activity. I had this experience as a Birthday gift this year. I did find the experience interesting as I enjoy wearing perfume, it made me realise what goes into the art of making a new perfume. The only problem I found was that after trying half a dozen of the essences I became nose blind, but overall a pleasant experience. Was gifted this experience from my wife and we went together. We both love our fragrance so thought it would be great to make our own, which we did! It was fantastic and I now have my own aftershave and my wife her own perfume. Warren was amazing and we learnt so much. I got my certificate by email and will definitely be ordering mine again! We were disappointed that all of the scent combinations had already been mixed, as we didn't really like most them. The perfumes smelt very chemically and musky and we are still awaiting our certificates over 3 months after the experience day. Although the lady who ran the class was lovely, we wouldn't recommend this experience day to anyone, as the end product is horrid, even after mixing the best of combinations available. 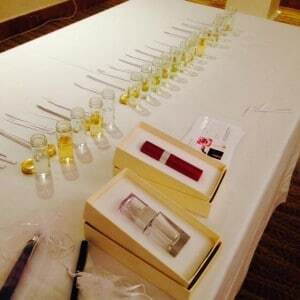 On Saturday the 11th of October I was kindly invited to attend a perfume making class at the luxury Hilton Hotel. The Hilton is located right next to Queensway Station so was extremely convenient to first find and get to. Once inside the Hilton, The Perfume Studio was clearly signposted for, with reception also there for guidance. The room was elegantly decorated with 6-8 participants per table with about 7 tables across the floor. I was pleasantly surprised with the exceptional turn out and noted the popularity of the experience- with one lady returning for the day (having taken the class a month before). Bottles of still and sparkling water were situated on each table along with a selection of perfume books for us to browse whilst everyone arrived. Helen and Warren acted as our perfume gurus for the afternoon and were excellent. Helen gave us all a warm welcome to the day with complimentary glasses of champagne. After a friendly chat with our table, Warren began the workshop. Warren was a perfect host and was clearly passionate about his job which was apparent from his extensive knowledge of the perfume industry. Warren’s personable nature and light humour gave the whole afternoon character and a relaxing atmosphere. I felt spoilt for choice as a collection of 18 scents across the perfume spectrum were displayed before us, ranging from the top, middle and base notes to capture nuances of the most popular fragrances that are currently on the high street. 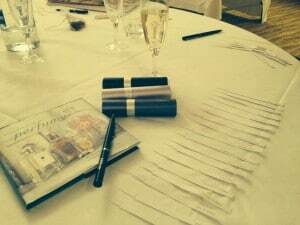 Each fragrance was numbered and handed out chronologically in accordance to Warren’s introduction of each scent. 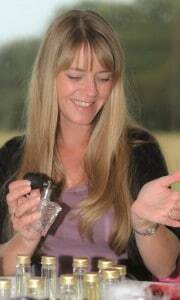 This description included a slight history, origin of terminology and personality type associated to the scent, Warren also referenced high street perfumes that incorporate the given scent into their bottles. This antidote was incredibly interesting as we learnt how to recreate our own designer perfumes at a fraction of the cost! The different traditional notes of the perfumes varied from Fresh, Floral, and Oriental to Woody ensuring a preference to suit eac h individual. The sense of smell has direct access to the amygdala, which in other words means that through conditioned responses smell has the power to trigger nostalgia. This can in turn elicit a memory or mood which is an unusual wonder; this was experienced throughout the afternoon as our table recalled fond time capsules from the past. The perfumes stimulated a whole new layer of meaning, when Warren instructed us to mix opposing scents to create a whole new blend in itself also known as an ‘accord’. A bag of coffee beans lay on each table to act as a palette cleanser so that our senses could almost revitalise to experience the new aromas that were now tickling under our noses. The ‘Fresh’ scents presented constituted juicy notes of; citrus, fruit and fresh green. The ‘Floral’ range was a mixed bouquet of jasmine, rose, gardenia, lily and a powdery aroma of vanilla or baby powder. The ‘Oriental’ scents composed of sweet spices, incense, amber and musk creating a more sensual and rich aroma. The ‘Woody’ scents also simulated a deeper undertone with scents of soft sandalwood, cedar wood which are more potent with a deep earthy smoky note. This peppery fusion is popular in male aftershave and colognes. The Perfume Studio also accommodate for a male market with a bottle designed as an old fashioned hip flask- an ideal unique gift for your partner or self. After much consideration I decided on an ozonic spicy blend with hints of jasmine naming it my own special fragrance ‘Poppy’s Opium’ to mimic the warm oriental fragrance by Yves Saint Laurent ‘Opium’. After our individual fragrances had been lovingly handpicked we were handed cards with all the printed 18 scents (referenced through our numbered tabs) to then create our own personalised perfume formula, perfumes consist of about 3-4 blends on average but you can have as many or as little scents as you wish. 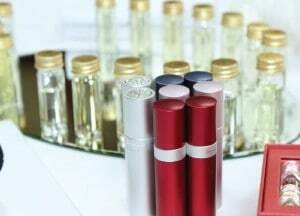 The perfumes were then amalgamated before us and filled in beautiful 20ml purse-spray atomisers, a perfect travel size! There is also the option to upgrade to different sized ml bottles. Also if you love your personalised fragrance (as much as I do) then your signature perfume formula is saved on ‘The Perfume Studio’s database so your scent can later be recreated at any given time to wear and forever cherish. I would thoroughly recommend this experience, it is ideal for a day out with your girlfriends or relatives- perfect for hen parties, wedding gifts, anniversaries, birthdays or just an enjoyable day out. 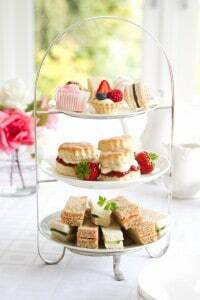 ‘The Perfume Studio’ currently offer a delicious decadent Afternoon Tea, which can be enjoyed after your class for a day of true indulgence and sophistication. Thanks to The Perfume Studio for inviting us! We interviewed Ben Janousek, one of the founders of ‘The Perfume Studio’ to find out more about their incredibly unique perfume making experiences. 1) Please explain a bit about the concept of Perfume Classes. Where did an interest in the market stem from? The Perfume Studio concept was created to fill a gap between the commercial perfumes on the market and high end bespoke perfumes. The off the shelf fragrances tend to be generic and offer nothing personal, so do not fit with individuals personalities and preferences, while the fragrances created by top perfumers are usually out of most people’s price range. 2) What are your objectives for the business? The Perfume Studio launched in 2005 but we are currently in the process of updating and re-branding the business, working hard to offer the best experience possible whilst keeping it accessible for a wide audience.Essentially, we want people to love their perfume and develop a life-long relationship with us, re-purchasing their fragrance and creating new ones for different seasons and occasions as well as gifting the experience to their friends and family. This is also why we have launched our perfume experience with the option of a delicious Afternoon Tea afterwards. 3) Do you have any exclusive information you can share with us about the Perfume Studio’s future? As a business, we expect the Perfume Studio to rapidly grow as we improve and expand what we offer. The Perfume industry is worth over £1 billion in UK alone and is dominated by a few major players. The Perfume Studio is 100% unique as we are the only company offering bespoke perfume as an affordable price. Customers are extremely savvy shoppers, always on the look out to experience something new and whilst they buy into ”brands” they also seek out individualism and quality. At The Perfume Studio we are creating a club environment using the finest perfumery ingredients but with the unique bespoke twist, giving customers the best of both worlds! No other company in the UK (or perhaps the world) offers the opportunity on a national basis to design your own bespoke perfume as per The Perfume Studio concept. All of our team have been trained under the watchful eye of our Master Perfumer Francois Robert and offer a completely unique, perfume blending experience. The personalised perfume is then registered onto our club database and your bespoke perfume can be ordered at any point in the future with the possibility in the future of personalising! 5) What are your most frequently asked questions from customers? Q. Can I re-order my perfume? A. Yes you can. When you create your fragrance you are automatically registered on our database. It’s simple to log onto our web-site and follow the instructions. Your perfume can be re-ordered directly and will arrive within 5 days! Q. Do you use natural ingredients? A. Like all perfumes on the market we use a combination of materials in our perfumes. 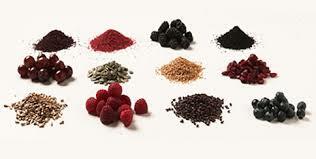 All of our blends contain high levels of natural ingredients. Our master perfumer Francois Robert has hand-picked only the highest quality materials for our blends. Can the Create Your Own Perfume - Gold Experience cater for 10 of us? The Create Your Own Perfume - Gold Experience can cater up to thirty two people, so you would be fine booking in for 10 people. Dates are subject to availability. Customers Under the age of 16 are welcome to take part in the Create Your Own Perfume, but each person under 16 must be accompanied by a participating adult. Which locations do you have for the perfume making experience? We have a huge amount of locations for the Gold perfume making experience including; Bedfordshire, Kent, Bath, Nottingham, Surrey, Norfolk, Edinburgh, Pembrokeshire, Essex, Hastings, Horsham, Brighton, Inverness, Lothian, London, Manchester, Wales, Cumbria, Reading, North Yorkshire, Lincolnshire, Hampshire, Southampton, Warwickshire and Cheshire. Is it possible to specify where the perfume making class takes place at the point of purchase? At the point of purchase the voucher is valid for all of the perfume making venues. When the recipient goes to redeem the voucher, they'll be able to choose which venue is most convenient, and book directly with that location. Can you have spectators to watch the Create Your Own Perfume - Gold Experience, or is it just for the people taking the experience? The Create Your Own Perfume - Gold Experience isn't suitable able for spectators I'm afraid. Are the ingredients used vegan and cruelty free? Yes, all ingredients used in the Create Your Own Perfume experience are completely vegan and cruelty free.